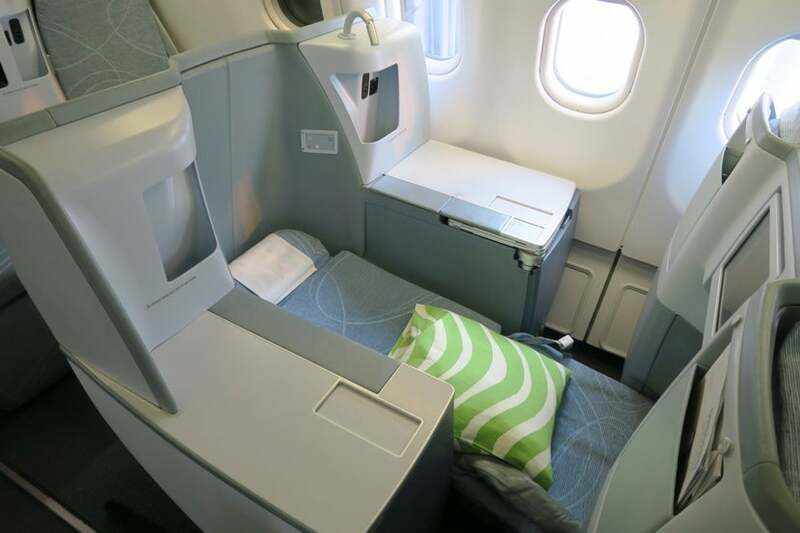 Finnair’s A330 from Helsinki (HEL) to Chicago (ORD) is a great way to get between the cities in style. The pros: impressive “throne seats,” cozy blankets and excellent service that made me feel more like a guest than a passenger. The cons: no in-flight Wi-Fi, iffy noise-canceling headphones and a bare-bones amenity kit. Oneworld alliance member Finnair has been growing its presence between Europe and the US over the past few years. 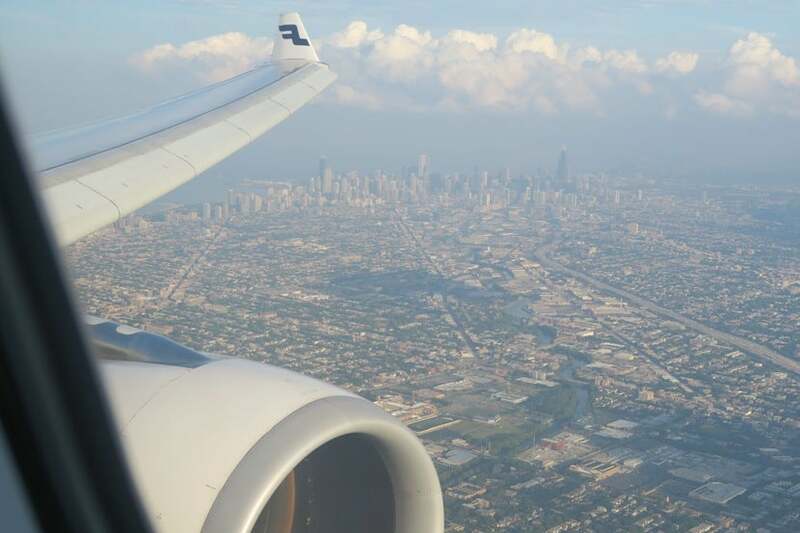 In June 2015, the carrier launched service between Helsinki (HEL) and Chicago (ORD) — a route that was intriguing enough to include on last year’s list of exciting routes to fly. Having already booked my flight to Europe, I was seeking an interesting option for my trip home. The Points Guy came through for me yet again, with an alert in January for wide-open award availability between the US and Europe. 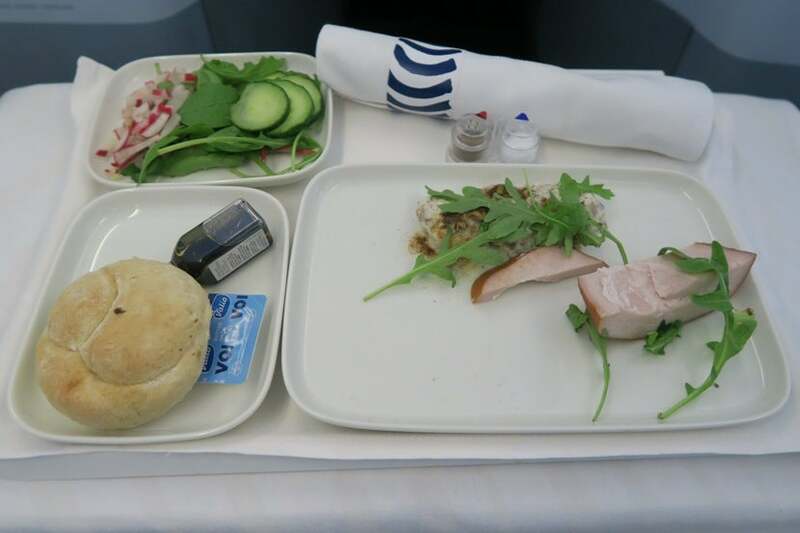 Having experienced various American Airlines business-class products, including British Airways 747 Club World and Iberia’s A340 business class (albeit on an intra-Europe flight), I was intrigued to find a Finnair business-class option. I jumped on it, redeeming 50,000 AAdvantage miles — as it was before the March 22 devaluation — and $60 in taxes. 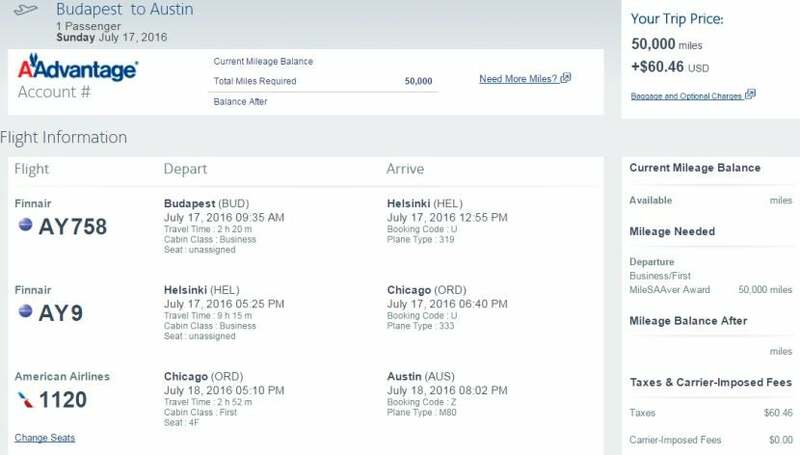 Currently, business-class flights between the US and Europe will cost you 57,500 AAdvantage miles each way. My itinerary from Budapest (BUD) back home to Austin (AUS) via Helsinki (HEL). I charged the modest $60 in taxes to my Chase Sapphire Preferred Card because of its excellent travel interruption insurance. However, if I was booking this flight today, I’d either choose to use the Chase Sapphire Reserve (since the trip delay insurance starts at six hours vs. the 12-hour starting point offered by the CSP) or the Citi Prestige card, since its trip delay insurance now applies to award tickets and kicks in after just three hours. 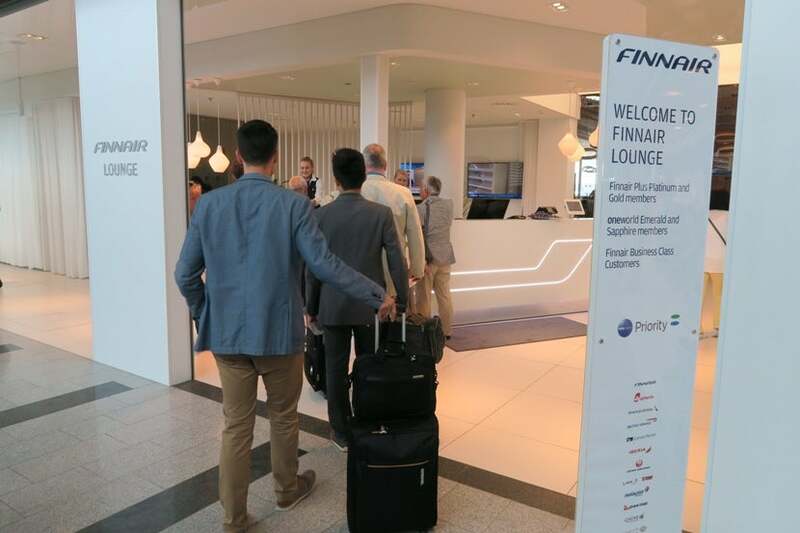 Once I arrived in Helsinki (HEL), I cleared European immigration and headed to the Finnair Lounge, which is located between Gates 36 and 37. 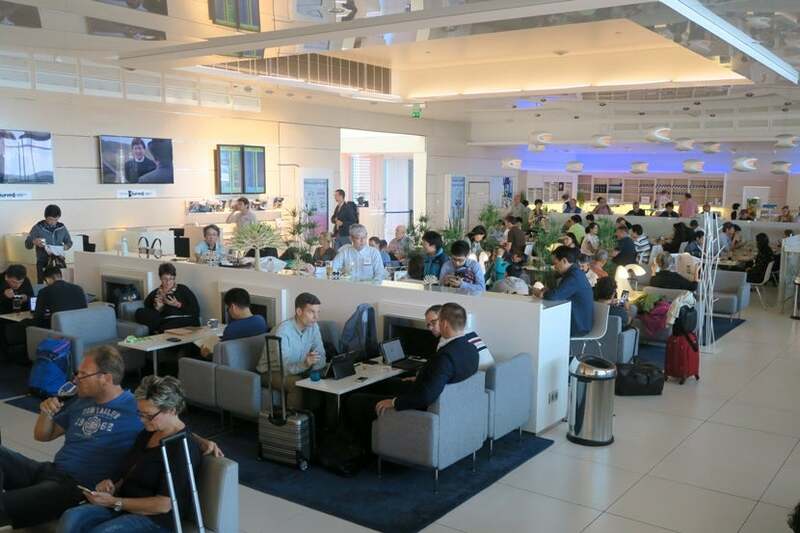 As my flight was departing from Gate 37, I was able to stay in the lounge longer knowing that it would just be a one-minute walk to where I’d need to board the plane. The Finnair Lounge was conveniently located next to Gate 37. The lounge was quite busy when I arrived, but surprising didn’t feel crowded once I settled in. There were plenty of passengers cycling through collecting food and drink items, while the staff hurried to keep replenishing the supply. The Finnair Lounge was pretty busy that afternoon. The internet service in the lounge was provided by the free airport Wi-Fi. Despite the crowded lounge, the Wi-Fi speeds were impressively fast (13 ms ping, 21.07 Mbps download and 36.89 Mbps upload). 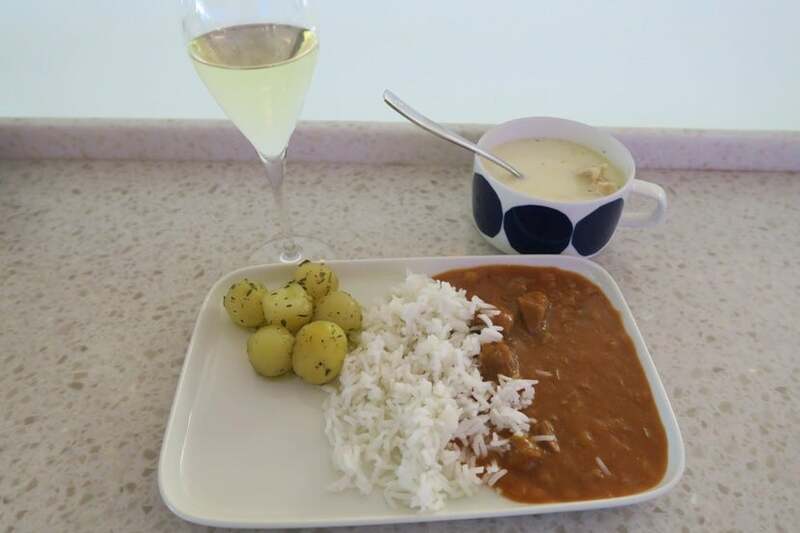 Perhaps thanks to the quick turn of food, all the hot meal items I tasted were fresh. The food wasn’t too gourmet, but served as a nice snack to carry passengers through the layover. A snack in the Finnair Lounge to hold me over until my dinner on the flight. For drinks, there was a selection of sodas, wines, Champagne and several beers on tap. Liquors were available from a bartender, who kept a supply of ready-made dry martinis on a tray for those seeking a quick drink. 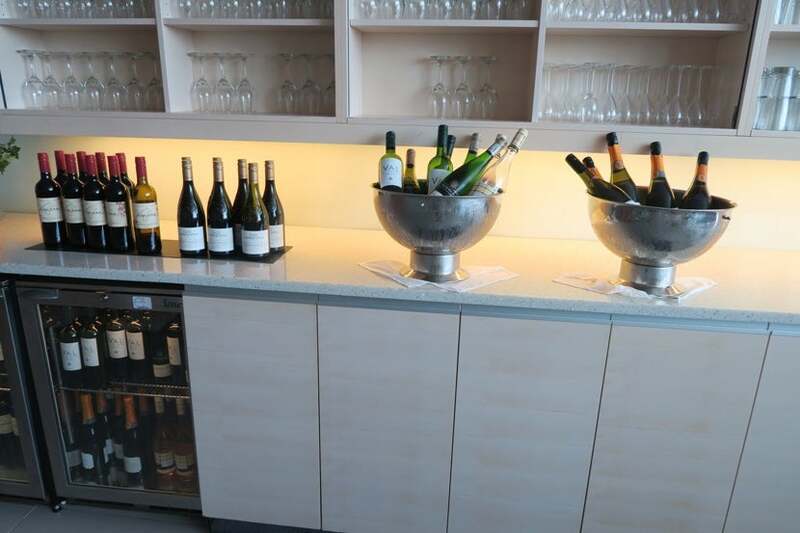 In order to keep up with the busy lounge, there were many bottles of each type of wine and Champagne left out for us. 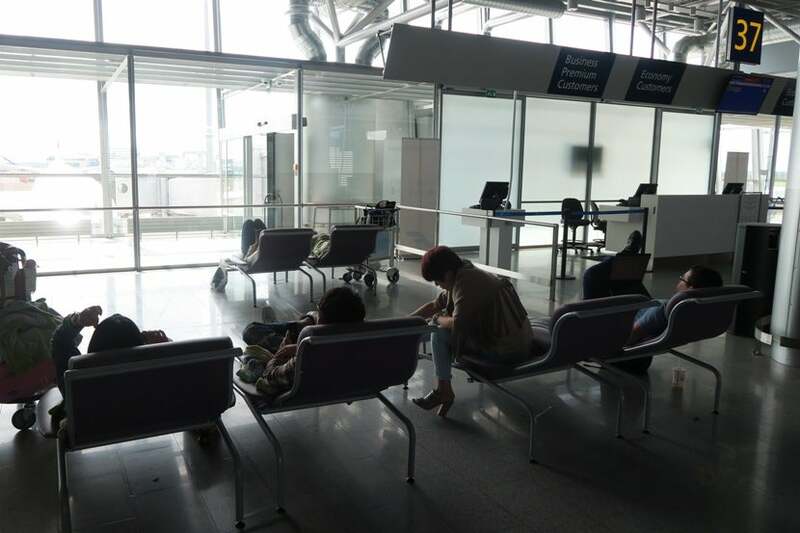 A few hours before my flight departed, the gate already had plenty of people camped out in the wide selection of seats — including lounge seats and large semi-private chairs with power outlets. Passengers who don’t have a lie-flat seat on-board might enjoy grabbing some sleep at the gate before the flight, instead. 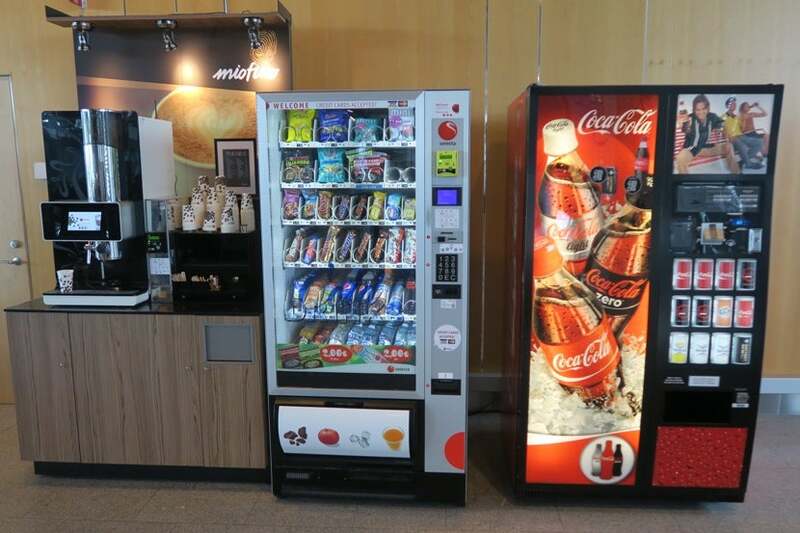 If you need a snack or drink right before boarding, there are a few vending machines with not-too-bad prices. There’s also a smoking lounge immediately next to Gate 37 for those who need a fix just before the nine-hour flight. Don’t have time to eat before your flight? There are vending machines right at Gate 37. 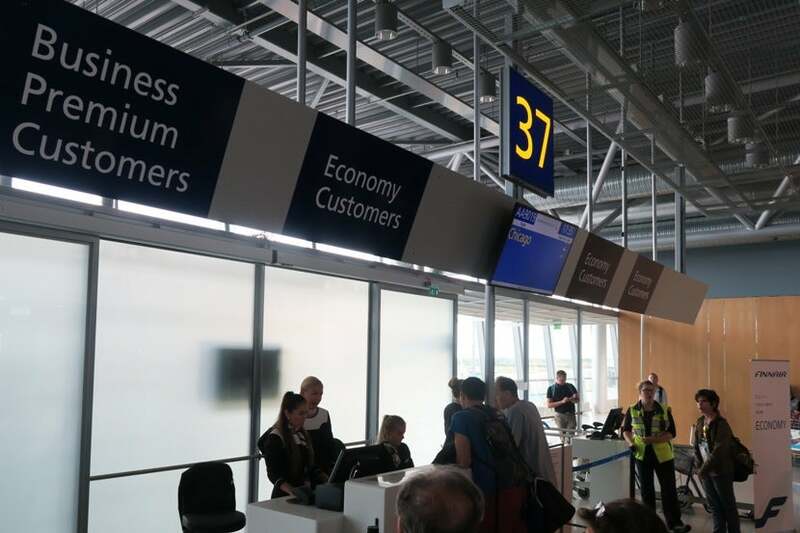 At the gate, passengers generally clustered around the rather-unhelpful signs of “Business Premium Customers” and three “Economy Customers” signs. When it came time to board, business-class passengers boxed each other out to board first. The boarding process was pretty unstructured due to the lack of clear lines. 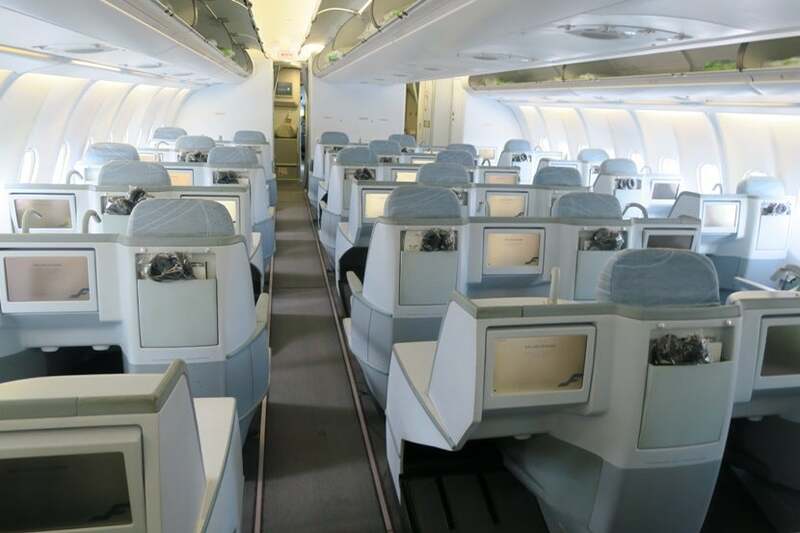 The A330-300 business-class section is arranged in a unique [2/1]-2-1 arrangement (similar to what Swiss offers on its A330). The first few rows seem to be slightly smaller due to the curvature of the plane. 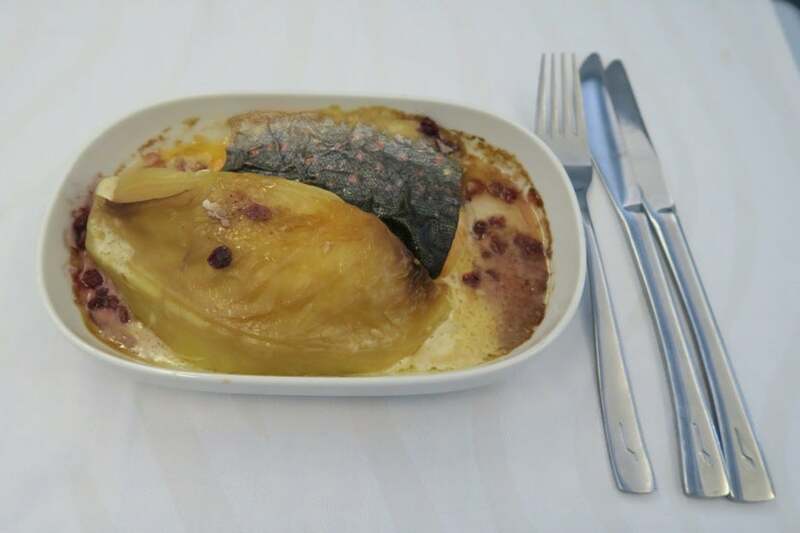 A word of warning if you’re a picky eater: you’ll want to grab a seat further forward in the cabin in order to ensure you get your choice — as the cabin crew served from the front to the back during each meal service. A peek at the business-class cabin. The best seats in the cabin are the “throne seats,” 2A, 4A and 6A, which have extra room on both sides of the seat and no row-mates. Having done my research, I chose seat 6A (pictured below). 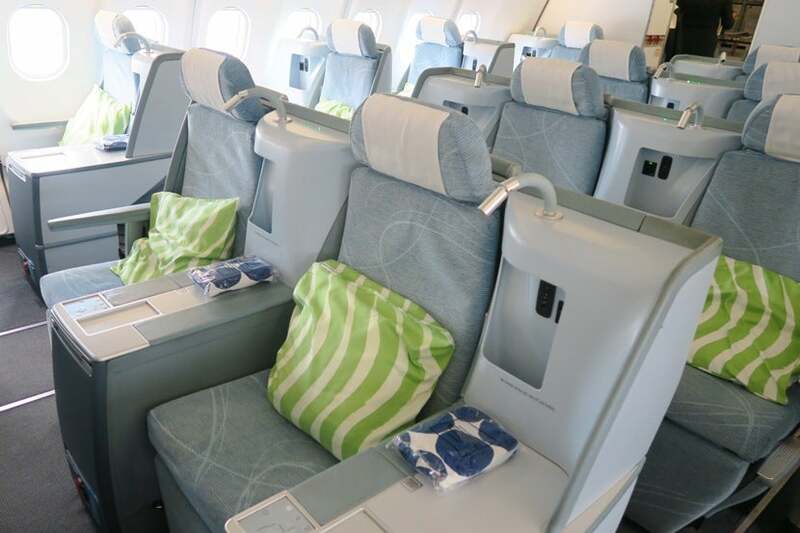 There are three “throne seats” on this version of the Finnair A330-300. Next, I’d recommend the L seats. Each of these seats allowed direct aisle access since there was only one seat per row. Seats 2L, 4L and 6L are set against the window and provide a bit more privacy than 1L, 3L, 5L and 7L, which are exposed to the aisle. The right side of the business class cabin features staggered one-seat rows. For couples, I’d recommend the middle seats, especially for an overnight flight when there isn’t much to see outside anyway. Both seats have aisle access, so either person could get up while the other one was sleeping. The middle seats are in arranged in staggered two-seat rows. My last pick for seats would be the A & C seats in rows 1, 3, 5 and 7, which have two seats but share one console. The seat pitch is listed as 60 inches, which allows enough room to maneuver in and out of most seats. However, in rows 1, 3, 5 and 7, the person sitting in the A seat will have to climb over the person in seat C to get to the aisle, making the narrower seat pitch potentially an issue — this is particularly a problem if the person in the C seat is fully reclined. I’d only recommend the A/C seats in rows 1, 3, 5 and 7 to couples hoping to sit by the window. Throughout the cabin, the seats are staggered to allow for each one to lie fully flat. 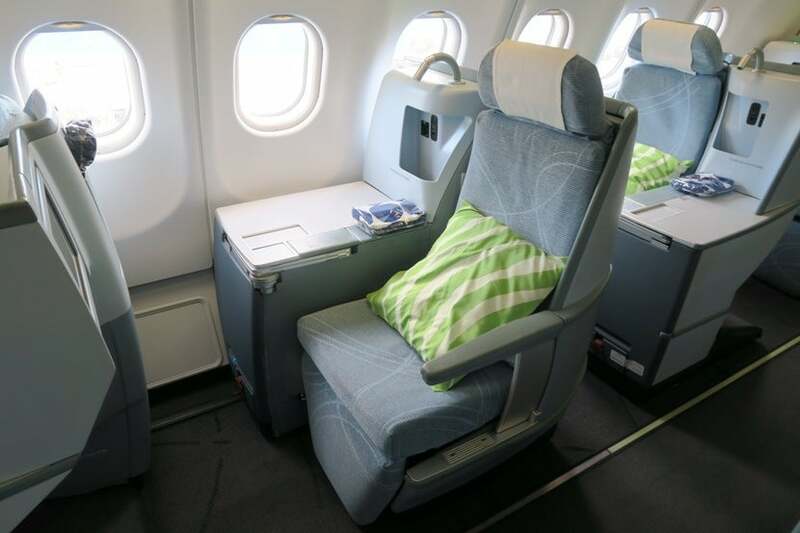 Although Finnair lists the bed length as 6′ 7″, the beds actually seem to be just 6′ tall. Even at 5’11” my feet reached the back wall of the footwell when the seat was in its lie-flat position. If you’re any taller, you’ll likely have to leave the seat in an angle-flat position to avoid having to bend yourself to fit in it properly. Due to the staggered arrangement of the seats, they aren’t very wide — just 21 inches — and you’re going to feel this narrowness especially when the seat is reclined. Each business class seat reclines into a lie-flat bed. Each seat has a universal power plug, USB plug, an ethernet cable, a personal work light, a cubby for storing a few small items near you and a seat-back pocket. Those sitting in the three “throne seats” each get two cubbies and two seat-back pockets, while those in the A/C rows have to share a seat-back pocket. All seats were stocked with a sizable and soft polyester-filled pillow. Lime-green blankets were handed out during the artificial night and then collected before landing. These blankets were warm and quite comfortable. A look at the in-seat storage and controls. Although the cabin looks modern, the seats themselves are starting to show some wear-and-tear. There were some significant scrapes, scratches and scuff marks on my seat indicating plenty of use. Before boarding, the cabin crew set out an amenity kit at each seat. 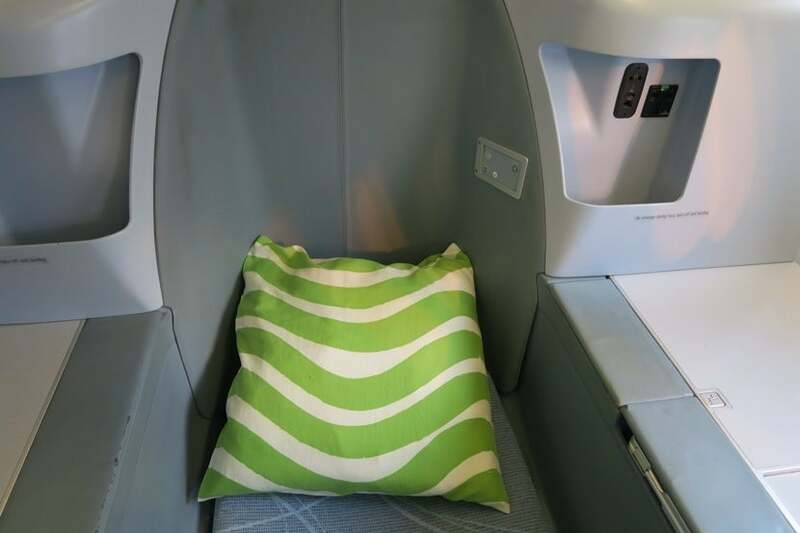 The blue-and-white Marimekko cloth bag included an eye mask, toothbrush and toothpaste, earplugs, skin cream and lip balm — not much more than what’s offered in Finnair’s Economy Comfort. In addition to what came in the amenity kit, a card noted that additional items were “available on request,” including slippers, socks, a shaving kit, mouthwash, hairbrush and makeup remover. I had no need for any of these items, so I didn’t request any of them. I applaud Finnair for reducing waste by having these available, but only on request. 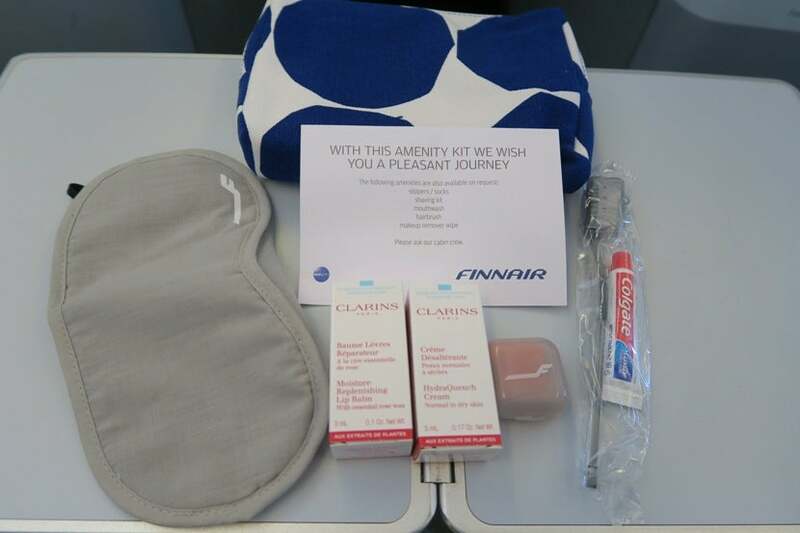 The Finnair amenity kit was basic, but more options were available on request. The in-flight entertainment system was well-stocked, with 81 movies and 94 “series” options, including American (i.e. “Empire,” “Gotham,” “How I Met Your Mother,” etc.) and international tv shows and documentaries. There was also a wide selection of music options organized as mixes. On the downside, the screens were pretty small at just 12.1 inches. Even at the highest level, the screens weren’t bright enough to overcome the glare from the overhead lights or windows. The in-flight entertainment screen size was a bit on the smaller side. 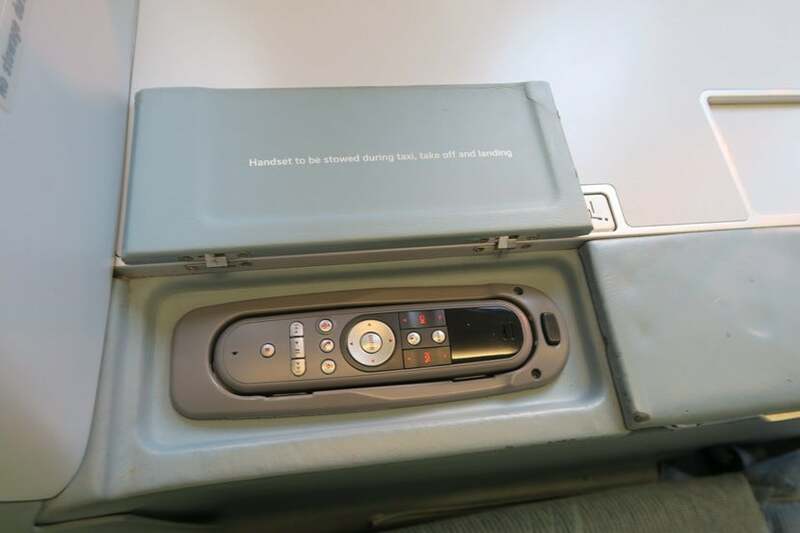 Although the IFE screens had a responsive touchscreen, a remote was available in the armrest. An in-flight entertainment remote was available, if desired. 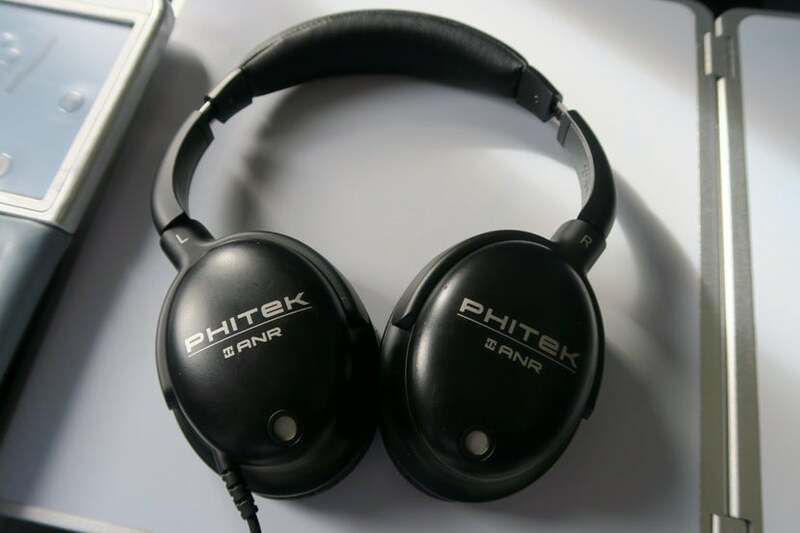 At boarding, each business-class seat was stocked with a pair of plastic-wrapped Phitek ANR noise-canceling headphones. While it wasn’t top-notch at noise canceling, they blocked just enough ambient noise — and had a crisp enough sound quality — to allow you to get lost in your entertainment option. Noise-canceling headphones were provided for the flight. During boarding, the crew passed through the cabin with a tray of Champagne glasses and Nicolas Feuillatte Brut Grande Reserve, which was conveniently available for sale through the on-board shopping magazine for €27.50 (~$31). The unique Finnair glasses were also available for sale for around $25 for two. Once in the air, the crew handed out food and drink menus. The options — and translations of the options — were extensive enough to for each to deserve its own pamphlet. There were separate menus given out for food and drinks. 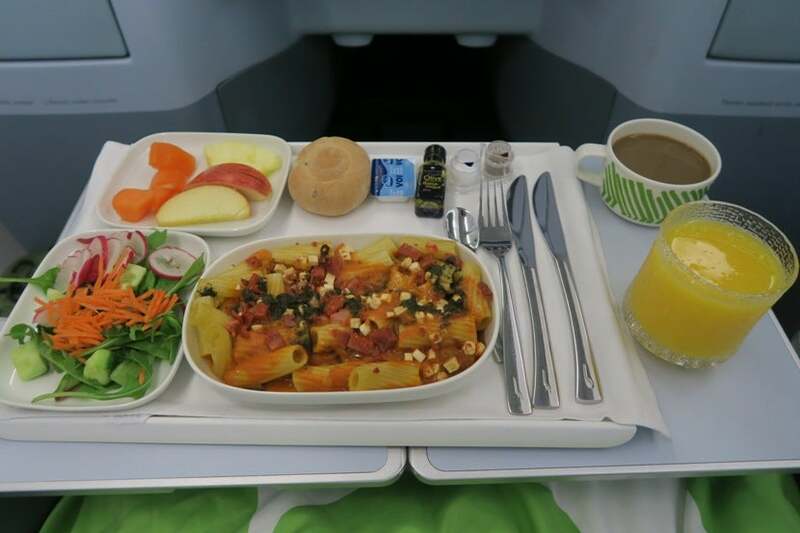 The food and drink service started about an hour after takeoff when the cabin crew served a first round of drinks. 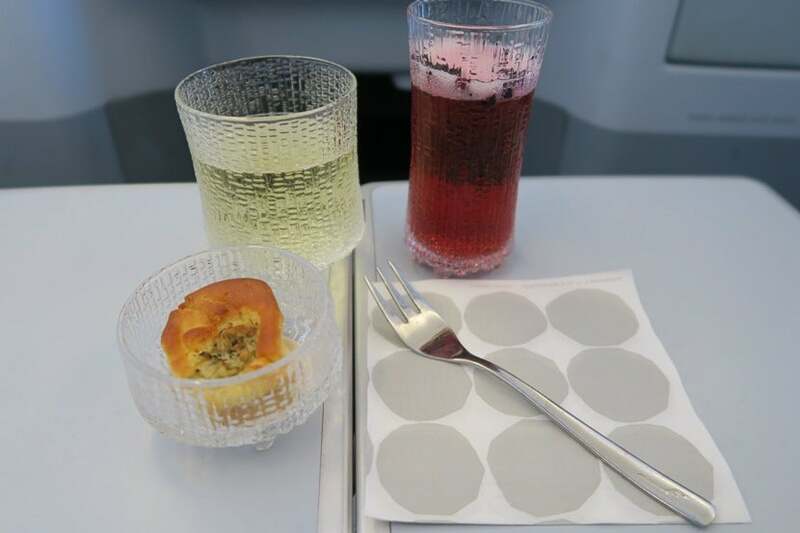 In addition to the white wine the flight attendant recommended with the starter, I tried the “Finnair Signature Drink,” a glass of Champagne with a blueberry liqueur that was topped with dried blueberries. The drinks were served with an “amuse bouche” starter — a small-but-rich pie with a creamy mayonnaise sauce. Drinks were served with an “amuse bouche” starter. The starter options included a choice of “smoked turkey with mushroom salad” or “roasted potato soup, nuts and brown butter.” I chose the salad option, but found that it wasn’t what I expected. Instead of having a mostly-greens salad, the focus of the dish was a serving of turkey. The meat itself was tender and slightly cured, a fine dish on its own, but even better with its creamy mushroom complement. The roll tasted fresh-baked, and the side salad was crisp. My smoked turkey with mushroom salad starter. While it didn’t win many points on presentation, the char was an excellent choice and was very flavorful while also remaining light. The roasted cabbage was surprisingly flavorful as well. My roasted char and cabbage, lemon and lingonberries main course. The last course consisted of a choice of desserts — although the cheese dish was listed on the menu as a fourth course, it was offered as an alternative to the dessert options. I gladly chose it over the “cupcake assortment” or ice cream options. 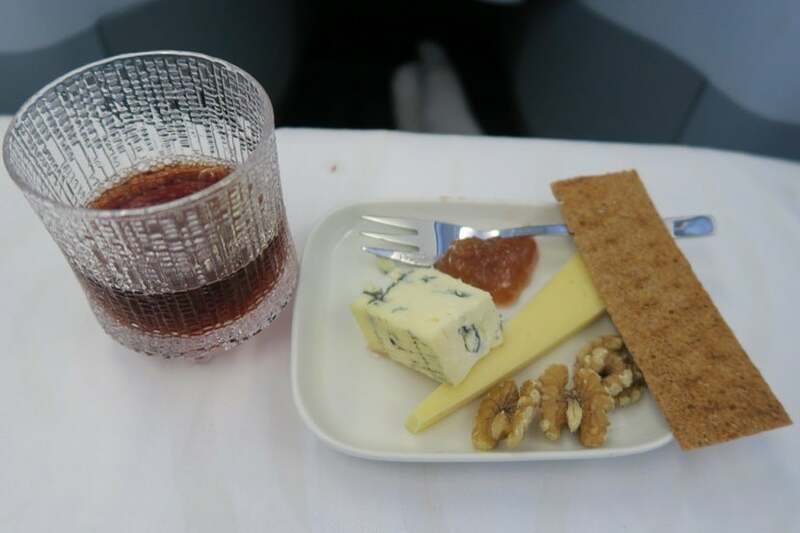 At the flight attendant’s suggestion, I paired the cheese plate with the 1997 Barão de Vilar Colheita Port. It was an excellent ending to a wonderful meal. Cheese, nuts and a port wine topped off the excellent dinner. For those who were hungry or thirsty between meals, there was a selection of snacks available in the galley. The options were basic — peanuts, chips and candy — and underwhelming. 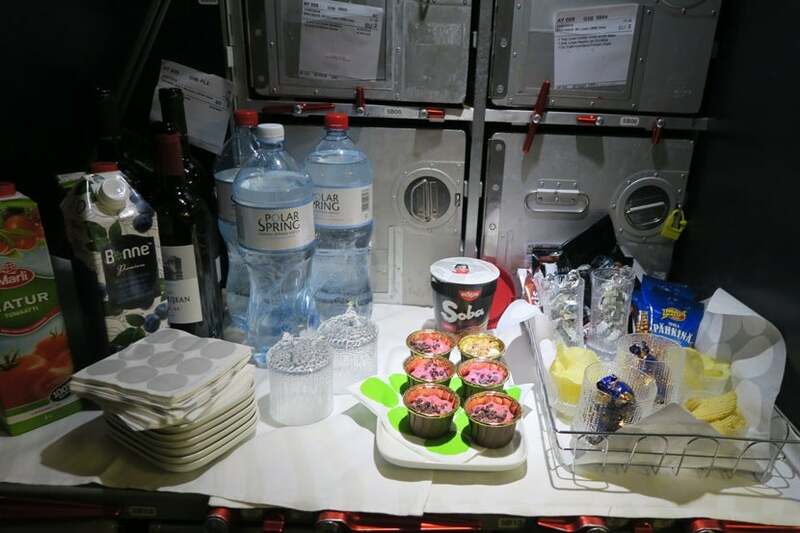 I visited an economy galley during the flight and found that the options there were similar, with sodas and chocolate bars being substituted for the wine and cupcakes we were offered. Some snacks were available in the galley between meals. Especially compared to the deliciousness of the first meal, the pasta dish served as the pre-arrival “light meal” was rather disappointing, with some parts of the pasta were crunchy from being overcooked during the reheating process. The accompanying fruit and salad were still fresh and tasty though. The roll was cool when served but wasn’t stale. A pre-arrival meal of rigatoni pasta with chorizo. 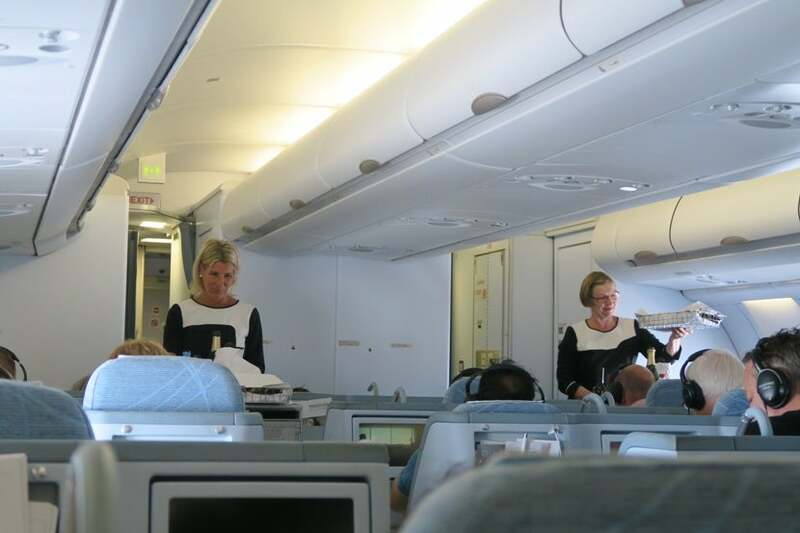 Throughout the entire flight, the cabin crew was cheerful and helpful. They truly made me feel like a visiting guest rather than just a passenger. While boarding, I mentioned that this was my first Finnair flight. At disembarkation, another flight attendant asked if I enjoyed my first Finnair flight and if she would see me again. Small touches of personalization like this were scattered through the flight and left a lasting and positive impression. The cabin crew was excellent throughout the flight. 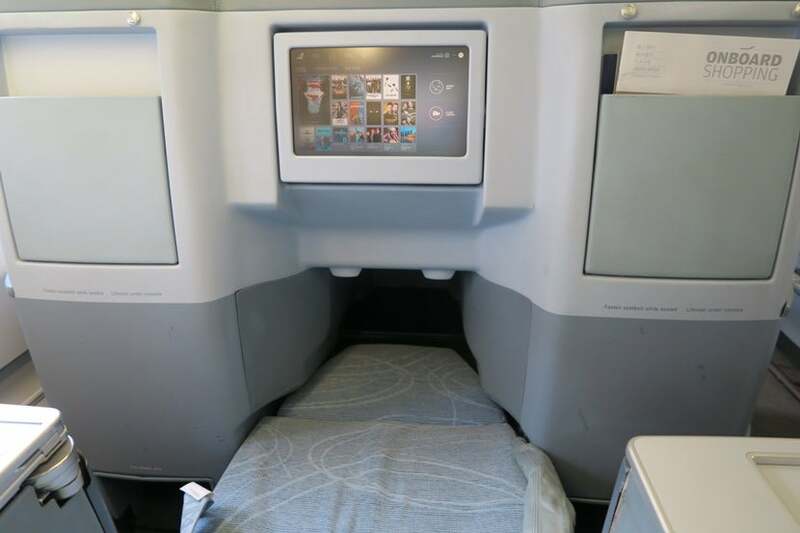 Business class on Finnair’s A330 is an excellent way to fly transatlantic. 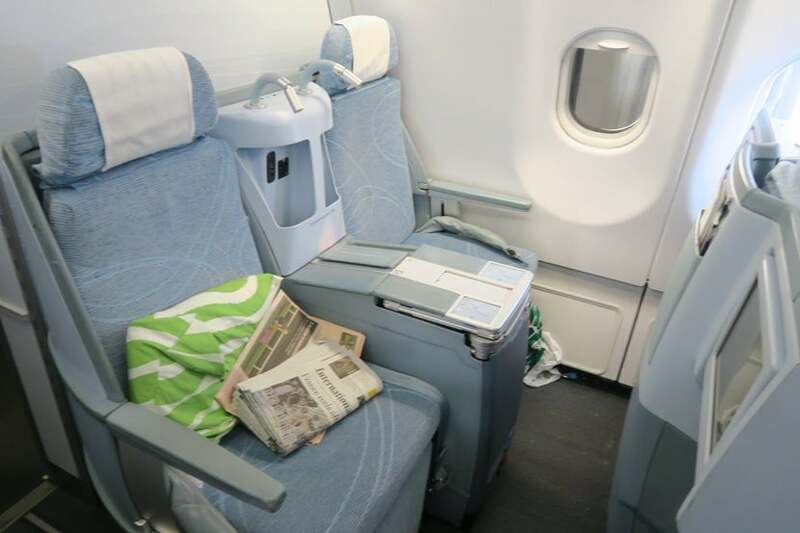 Even as a stingy traveler — who’d typically rather fly two award trips in economy than one in business class — I’d be tempted to redeem 57,500 AAdvantage miles to fly in Finnair’s business class again. Although, next time I’ll seek out the Finnair A350, which has Wi-Fi. 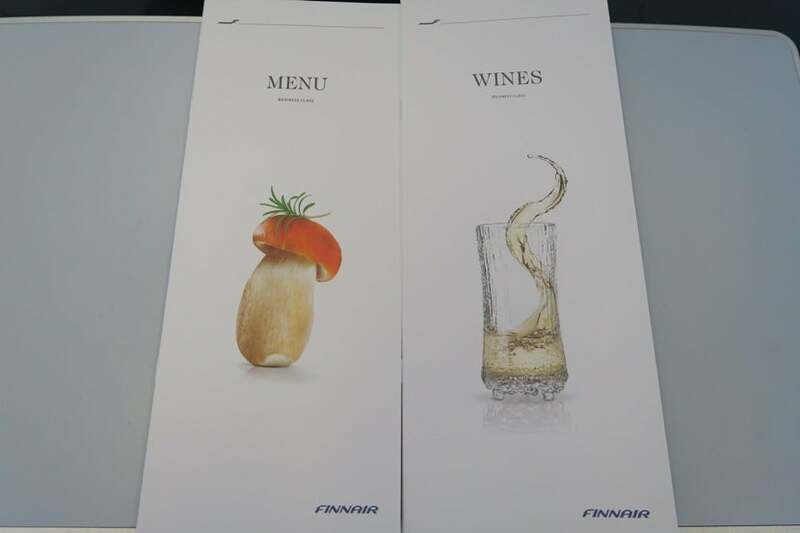 Either way, I’d certainly choose Finnair’s business class product over American Airlines’ because of the much-better service and wine selection. I had an excellent view of downtown Chicago on our final approach into ORD. While not having Wi-Fi isn’t ideal, if you’re able to disconnect, Finnair’s top-notch service, food, lie-flat seats and wide selection of entertainment options will keep you satisfied in many ways. As the seating options vary widely throughout the cabin, just make sure to pick your seat early to get one of the better options. 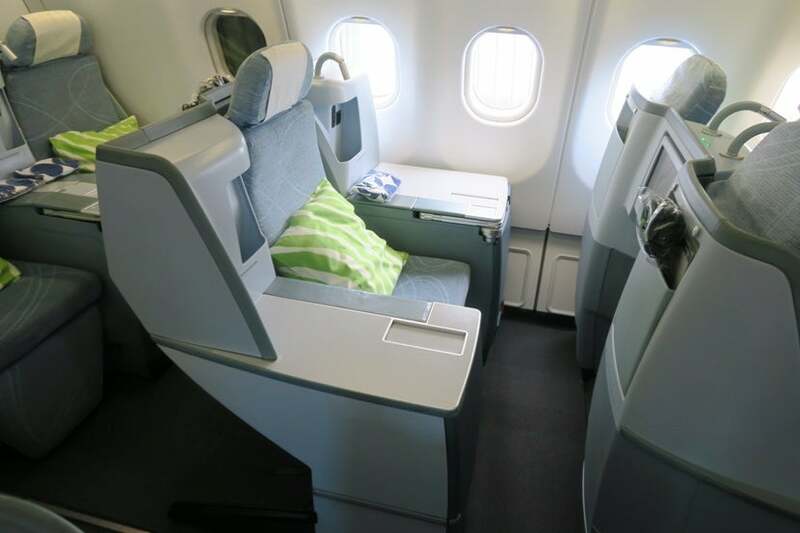 Have you ever flown in Finnair’s business class before? Tell us about your experience, below.